Jacqueline Fahey was born in Timaru. She graduated from the University of Canterbury with a Diploma in Fine Art in 1951. She is one of New Zealand’s leading painters. Christine Massey, the young woman in this painting, was around eighteen years old when she was painted in Fahey’s Auckland kitchen. Christine’s parents were reportedly disappointed in her decision to dress as a ‘hippy’. Fahey had a big influence on Christine’s decision to go to art school at the University of Canterbury and she is now a sculptor living in Auckland. 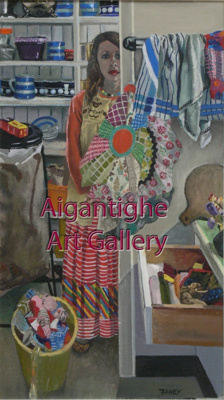 Fahey has depicted Christine in a working kitchen leading into the pantry surrounded by both order and clutter. Viewers will recognize Cornishware crockery and other kitchen things which they have at home. Kiwiana items can be seen such as the home-made oven-cloth of recycled fabric and sugarbag sacking common earlier in the Twentieth Century. Objects usually kept out of view such as the clean-sack rubbish bin are included deliberately. This painting is distinctly structured vertically in half. Fahey has captured Christine’s feelings of alienation or shyness as she retreats back into the pantry, only just meeting the viewer’s gaze, almost as if the viewer becomes her parents disapproving of her dress. Purchased in 1978 from the artist using Sevicke-Jones Trust funds with assistance from the QEII Arts Council.